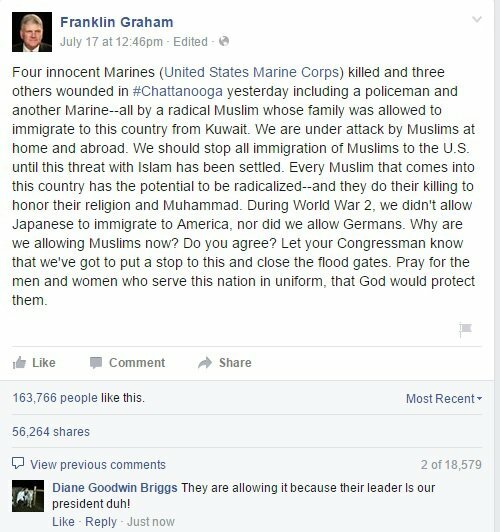 Franklin Graham, the son of evangelist Billy Graham and head of the non-profit Samaritan’s Purse, thinks it would be a great idea to ban all Muslims from the United States. And he justifies his position by saying it’s what we did in World War II to the Germans and Japanese. So is this moron advocating that we take the approximately 7 million members of the Islamic faith we have living in the United States and imprison them in internment camps, the same way we did Japanese-Americans at the height of the Second World War? I cannot help but notice that Graham fails to mention the terrorist acts of white so-called Christians such as Timothy McVeigh and Dylann Roof. Should we start rounding up all the white right-wing extremist young men who are a much bigger threat to our safety than Muslims will ever be? Mr. Graham would never consent to that, because then who would send him money and vote for his beloved Republican Party? What happened in Chattanooga is tragic, horrible, and vile. But if we start to oppress a religious minority in our country and seek to turn them into second-class citizens, then we have lowered ourselves to the level of the terrorist who committed these heinous acts. We are better than that. Whether Franklin Graham realizes it or not, what he proposes is also a form of terrorism. This entry was posted in Religion and tagged religious extremism. Bookmark the permalink. While the original Rev. Billy Graham always made me uneasy, first as a child (I was born about the time of his rise to prominence), his children are more than unsettling. They are irrational people filled with hatred they did not inherit from their (admittedly narcissistic) father. Still what troubles me most is not them but their acolytes, the Republican base represented in the Facebook comments included in this article. These are typical of the unreasoned, uninformed, xenophobic, confused and extremely violent (as in lynch mob violent) talking points which have been carefully cultivated by the GOP via self-appointed “messengers of God.” These people are dangerous, their speech and their thoughts are dangerous, and their ability to function as part of a civil society — especially a civil American society — is nil. They are fringe characters, but by their very own admissions they are in a league (if not in league) with characters like Dylan Roof and Timothy McVeigh. While we cannot silence them, nor should we (we need to know who and where and how many they are), we do need to reach out to as many as we can, knowing in advance that the chance for success is small. Failing at that, we need to discourage, if not actually attack them. Their number is relatively small, but we need to be aware of them, because the fact that they are ignorant does not preclude their spreading the virus of hate and of their voting in elections. It is a warning to every responsible American to pay attention to the followers of those who would pander to these poor lost souls who have the (admittedly small) potential to plunge us into a dark age. While I do not believe that is likely, apathy has been known to lead to some very bad outcomes. Meanwhile we do need to challenge the panderers, such as Rev. Franklin Graham, who knows his audience well and is masterful at conducting the Greek chorus of raw, naked hate and willful ignorance. Simply showing off these perverts and mountebanks to fellow liberals is not enough. We must engage them actively, calmly, and with the little respect they are due as humans, deconstruct each argument, use their religiosity against them, and leave them moving on to the next one. The less of this poison there is in the public square, the better. Only we can make it unsustainable, and we might look to Sen. Bernie Sanders and his remarkable approach to the student body of Liberty University as an example of how this might be done. I loved Billy Graham. Franklin is not his Dad; he is much more radical than his father, putting him in the same class of other evangelistic pastors, who have preached hatred and bigotry. If one is really knowledgeable about Billy Graham’s ministry, you would know that he just based his sermons on the bible. He didn’t instill in you the fear of going to Hell, and he was just amazing. I am also fearful of too much Muslim immigration in this country. Between the American terrorists, the crazies with assault weapons, the excesses of the dangerous cults of the radical Christian right, the KKK and other white supremacists, mass shootings and now the possible immigration of Muslim terrorists who could exert their power on other Muslims and even some non-Muslims, how can we feel safe in America? People leave to go fight with ISIS, and then they return. Do they still believe in that cause or have they changed their views?. The writer of this article is in denial. Do you realize the state Europe is in? Estimates are that in 25-30 years Europe will be predominantly Muslim. As a result, they will vote themselves into power. Once they get control they can change those nation’s constitutions as they please. While many may be moderate, all that has to happen is for their to be an extremist push such as happened with the Arab Spring. Europe will turn into the middle east, a war zone. If the naive, politically correct people dont stop and wake up it will be too late. 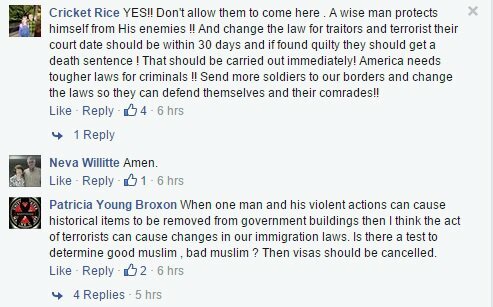 I find it interesting that they are hell-bent on defending Muslims when they dont have a clue. Unless we listen to Franklin’s sound advice, it will be too late here too. Maybe the only way to prevent it is to have our own civil war (again). Not against Muslims per se, but against the politically correct in this country who are the ones who are truly to blame. I hope that doesn’t have to happen, but if it comes down to it, I would be obliged to join in the fray. Think about it, author. I am not alone. You better start thinking about what your fellow Americans think rather than listening to your own misguided notions of tolerance and compassion. The greatest threat to America, and indeed to the rest of world, at this point in history, comes from the staunch advocates of right wing ideology, and I must submit this warning to you: There is a grave problem with the right wing movement, in that; they seem to possess a distorted sense of entitlement. They’ve set themselves apart, and seem to think that their faith gives them the right to view the world from a platitude of conceit, through condescending eyes, and with a false sense of superiority. They actually believe themselves to be superior beings, with a manifest destiny and some strange notion that God is on their side. A people with a desire to conquer, under the false guise of Christianity, seeking to dominate in the name of Christ, their view of humanity being reduced to nothing more than a matter of “us” and “them”. What they fail to realize is; if the Christ you believe in leads you to view other humans as lesser beings, then you are a follower of the anti-Christ. The plain truth is; God doesn’t have a religion and God doesn’t discriminate. Any religion that professes to be the only true religion, or that they‘re special in the eyes of God preaches false doctrine. If the Spirit of God is truly with you, it will only be known by acts of “unconditional” love and charity. No religion can claim exclusive rights to God. He belongs to all that He has created, and to foster a belief in “us” and “them” is to divide humanity, not unite it. And so it will be, in The End, that those who have set themselves apart from their fellow man will find that they have set themselves apart from God. The worth of a soul will only be measured by how much it has loved, nothing more, nothing less. Woe to those who have taken the widow’s mite and built castles and empires in His name. They have incurred a great accountability, their suffering will be unending. Even Jesus will not claim to be Christian, but will only proclaim the glory of the Father. And when He returns they will shout: “Here we are Lord!” And He will respond: “I never knew you”. They have forsaken the Word and have become prisoners of the Numbers. Those who have put themselves first will be last.